Nothing is worse than lying in bed, hearing water dripping, and having absolutely no idea where the leak is coming from. The first places you check will be the most obvious. The bathtub, sink, and toilet are where most leaks occur, but you cannot find any problems around those areas. What can you do when you hear water leaking but cannot find the source of the problem? If you can hear the water, you probably aren’t just hearing things. Dripping water can be a sign of a serious San Diego plumbing problem in the making. We recommend first checking your tub or sink drain pipe, this is usually the source of the all the noise. Almost all drain pipes nowadays are fixed with either a J or P trap that helps close off your house from nasty sewer gases. In most cases, water drains out of one side of the pipe before overflowing downward on the other side and down the drain. After your sink or bathtub has finished draining all of the water, the water should sit level on both sides of the pipe. Unfortunately if one of the sides of the pipe is clogged, it will take an extended period of time after shutting off the water for the trap to fill with a balanced level of water. If this is the case, water will probably get backed up on one side of the pipe and slowly trickle down the other side. So you have finally found where that dripping water is coming from, now all you need to do is fix the clog and get everything working correctly again. A regular household plunger can easily fix this problem for you if the clog is not too bad. Vigorously plunge your drain and see if it fixes the plumbing problem. If the problem still remains, try going to your local hardware store and buying a drain cleaning solution. If you want to be environmentally friendly you can try pouring some baking soda and vinegar down the drain. 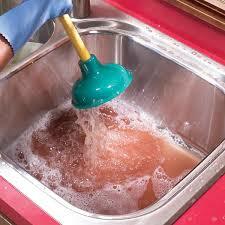 The chemical reaction could be enough to completely clear the clog, especially if it is a result of soap build up.